Hibs boss Neil Lennon confessed to agonising for hours before deciding who would be in the starting line-up for the Championship showdown with title rivals Dundee United before naming his side shortly before kick-off. But skipper David Gray believes his gaffer will have even greater headaches in the coming weeks as, at last, his full squad becomes available. Crocked Scotland internationalist John McGinn returned after ankle surgery to cap a stunning cameo performance, adding a third goal to team-mate Jason Cummings’ first-half double to complete the demolition of United and fire the Capital club four points clear of their biggest challengers. But, with the arrival of flying machine Chris Humphrey, the imminent return of midfielder Fraser Fyvie after a six-match absence due to a groin tear, and the hope on-loan Celtic ace Kris Commons may stay to the end of the season, Gray admits to sympathising with the predicament Lennon now finds himself in. The right-back said: “The manager probably had a headache deciding what team he was going to play on Friday but it’s going to be like that, tough decisions because of the squad we have. Lennon admitted one of his big calls was pitching Humphrey straight into the fray, the former Motherwell wide man having not played since the beginning of October and only being released by Preston North End a few days prior to the United game. But his gamble paid off, the 29-year-old setting the tone as Hibs made a whirlwind start by leaving United defender Paul Dixon sitting on the seat of his pants only two minutes into the game before going on to set up Cummings for his 11th and 12th goals of the season. And Gray insisted the injection of pace Humphrey brought on the right wing, allied to the speed of Martin Boyle on the opposite flank, would have made it tough for any team facing a Hibs side in such rampant mood. He said: “I’m just glad Chris is in my team and that I’m not playing against him. Like Martin on the other side, he has real genuine pace which is hard to play against. You could tell right away we were on the front foot. “We had Marvin Bartley and Dylan McGeouch winning the ball back in the middle of the pitch which let us break quickly so it would have been difficult for any team to live with those two the way they were playing. For me, it was great to have someone in front I can just give the ball to and let him get on with it. He was fantastic. Long may that continue. “I thought Chris was outstanding, he gave Dixon a real hard time, but it could have been anyone. His touch for the second goal took Dixon right out of the game but his cross was perfect too. Given what was at stake, Lennon opted for an attack-minded team, his determination to gain the win and so open up a four-point gap on United underlined by the fact that other than goalkeeper Otso Virtanen and defender Liam Fontaine, his five other substitutes were all forward-going players. And like his decision to play Humphrey from the off, it paid dividends with a performance which manager and captain alike hailed as Hibs’ best of the season. Ray McKinnon’s players probably thought otherwise, but the vast majority of the near sell-out 18,786 spectators would have been in full agreement with Gray, who insisted the home support had played their part on the night. He said: “I think there might have been a bit more pressure on us had we not beaten Falkirk the week before but the incentive was there to win and go four points clear which would be a big boost and that’s the way it was. “When Easter Road is full like that, there’s no better place to play football. Playing in front of a crowd like that and you make a good start they then get right behind you which must make it an intimidating place for an away team to come and play and if we continue to play like that we will take a bit of beating. 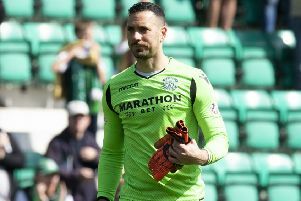 Although Hibs looked comfortably in charge thanks to that Cummings double, Gray admitted he was relieved to see McGinn step from the bench, take McGeouch’s short corner and slip the ball under United goalkeeper Cammy Bell to ensure there was no way back for the Tayside club. He said: “John comes on and lifts the crowd again. He’s a big player for us, a big part of what we do. He made a difference when he came on. To play as he did and to get a goal was brilliant. You wouldn’t have known he’d been out so long but then we have Fraser not too far away from coming back which will again add to our strength in depth. Gray was also delighted to see his side take the lead for the first time in three games, Hibs having been forced to come from behind to claim draws against Morton and Raith Rovers before Commons’ late strike beat Falkirk to return the club to the top of the table as United suffered a shock defeat at part-time Dumbarton.